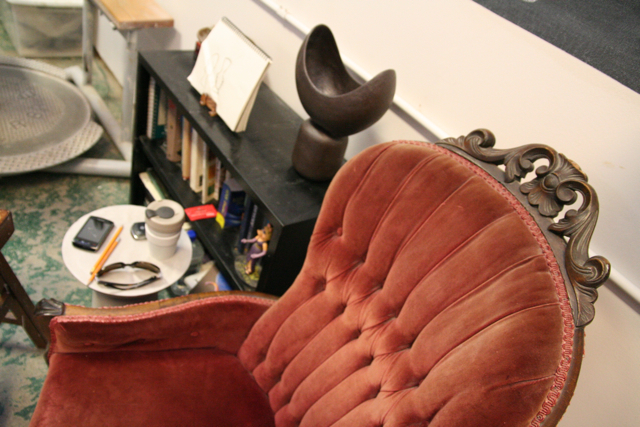 Sitting with Erin McGuiness in her studio (eating teacakes from Bette’s To Go – yum!) is like sitting with a girlfriend and having a good gossip. Until, that is, you look around at the work, and then you realize that you’re in the presence of a major talent. 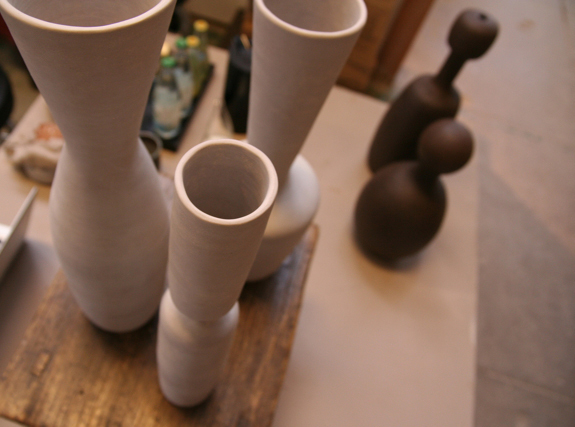 Erin’s metier is ceramics. 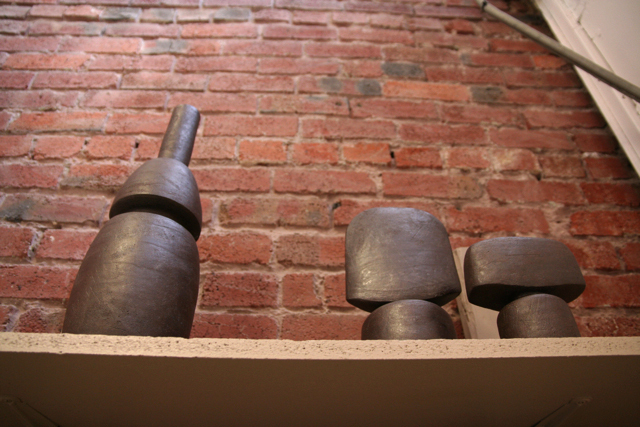 She makes unglazed vessels –sculptures, really– in dark and light that are intensely satisfying. (She calls her style cultivated wildness.) They’re refined, yet earthy; masculine yet feminine; quiet yet audacious; sensuous yet chaste; visually smooth yet slightly rough to the touch. You feel the influences: Japanese, African, Italian; and they’d fit in any environment–from classic to shaker to mid-century to loft minimalist to industrial eclectic. Looking around her studio, you immediately sense her stylist’s eye, her appreciation of still life, and her meticulous sensibility. Everything is just right–from the drawings on the chalkboard, to her use of her own work as vessels for clay, tools and flowers. Erin is one of those lucky people who figured out at an early age what she wanted to do–and had the fortitude to stick with it. 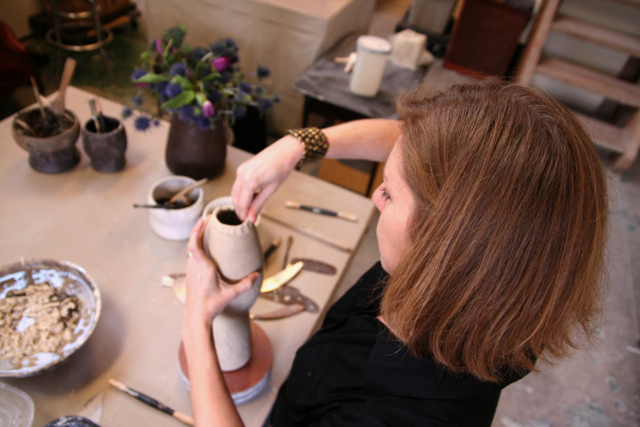 She started her exploration in high school in Northern VA, where she apprenticed with ceramic artists (and honed her eye during trips to local museums like the Smithsonian). 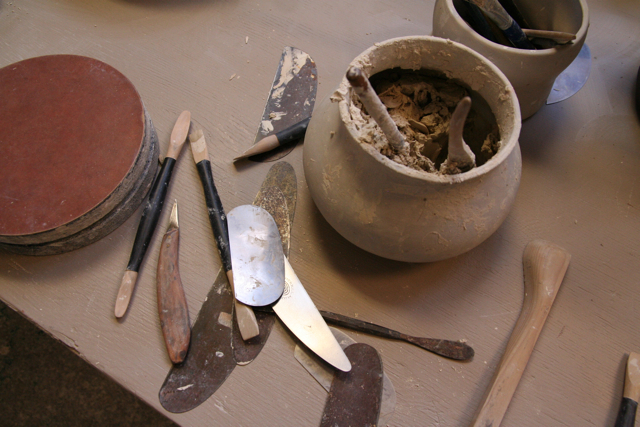 She then went to Earlham College where she studied Fine Arts with a specialty in Ceramics. From there, an apprenticeship in Pittsburgh and a move out to California some 12 years ago. Working first at a studio in Bolinas, she moved on to prestigious Ruby’s in San Francisco. She finally moved to the East Bay and now is at Earthworks, a gallery and studio in Berkeley. Art’s in her blood: her grandmothers were musicians, her father started out as a professional photographer, and her mother was an art history major, continuing with fine arts post-college. We’re delighted to see how far she’s come today – creative genes plus a love of art plus an entrepreneurial design spirit – she’s got the whole package. 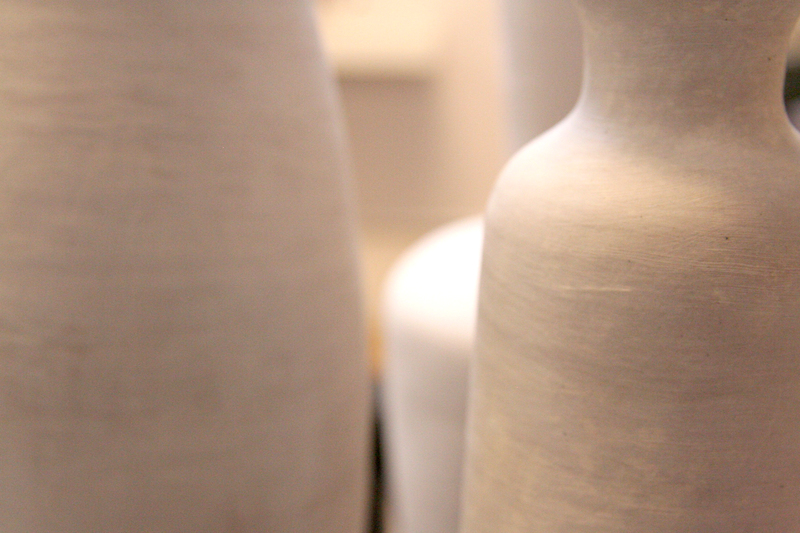 What speaks to you about ceramics? 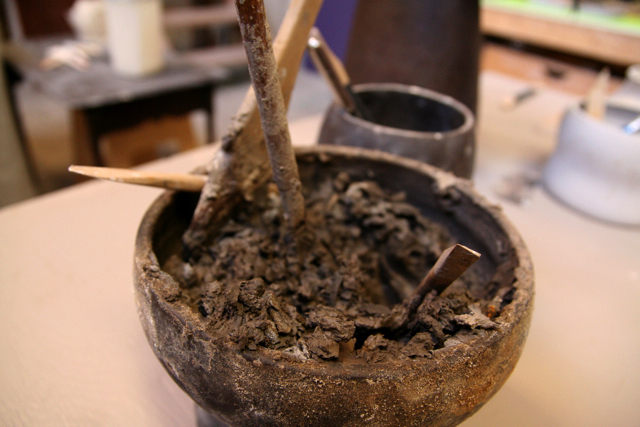 Something about how organic the clay is, how receptive it is to design. I love how it can evolve. 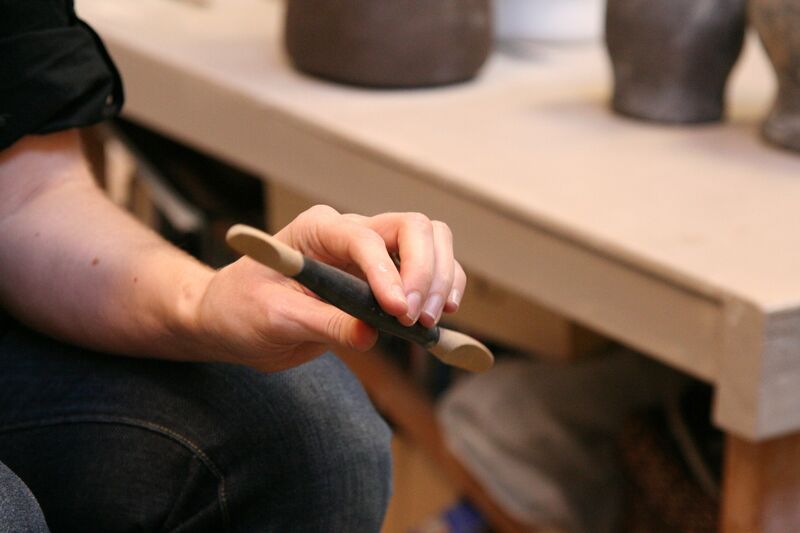 And the firing is fun….anything can happen in the kiln…you just have to relinquish control at that point. I love that you don’t have to be as planned as you have to be with a medium like metal. What inspires? I love the DeYoung–especially the African and Oceanic art sections. Then there’s design and architecture magazines…and nature (I love to hike) and then many different kinds of artists–Ruth Asawa (sculptor), Hiroshi Sugimoto (photographer), Isamu Noguchi (architect, designer), Constantin Brancusi (sculptor) and Toshiko Takaezu, another ceramicist. Even music inspires–I’m starting to get into classical music. I love Bach and Debussy…I love the beauty and harmony, it’s layered and intellectual without being stuffy. Also, I work a lot with designers, and I love to collaborate with them. How is it working with designers? I really enjoy it. They give me a sense of the space that they’re trying to fill and what they’re trying to evoke–I love the challenge figuring out what to do with that space. I generally make groupings of vessels rather than just a single one, and I love the challenge of playing with the forms and the ordering to get the effect I want. A lot of artists don’t work like that, do they? (Slight smile.) I guess not, but I like the challenge, and I like working with designers. I actively market to designers and interior designers, in fact, and it’s been a good thing for me. I really look for designers whose aesthetic I think I can be a part of, and I market to them. And how did you begin to work using the coiling technique? 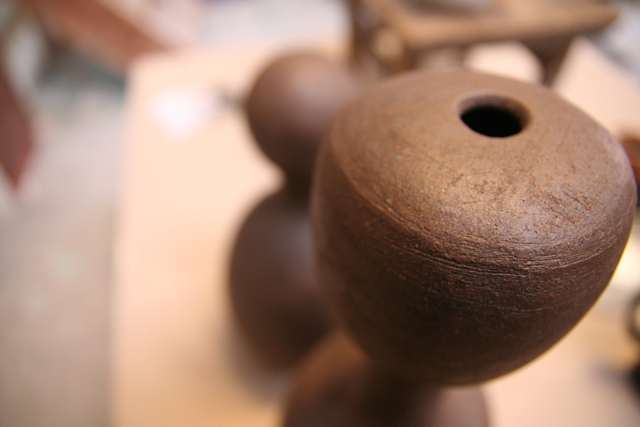 Well I started out doing functional work and traditional throwing….coiling came later after I took a class, saw the technique being used. It allows me to achieve the shapes I want. How long does it take to produce a single work? It depends, obviously…but I tend to work on groupings–so maybe it’ll take 20 hours for a group of 5…something like that. There’s a lot of time spent thinking and designing before I even start working with the clay. With some of my taller, thinner forms, for example, I need to weight the bases to make sure they’re stable. So what next? Oh, lots of things! 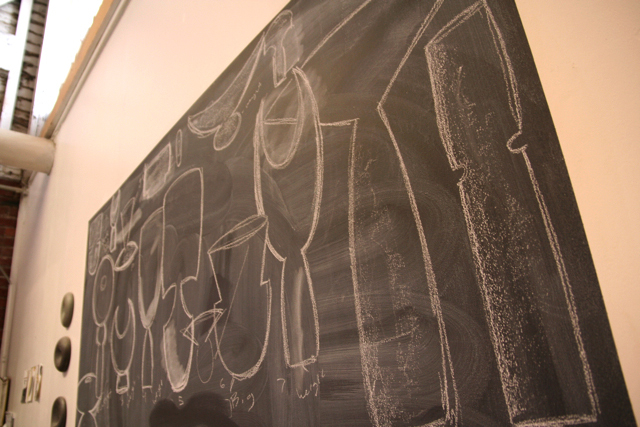 Maybe some wall pieces….definitely exploring that. I love jewelry. I would love to work in that form. I’ve been doing some casting, and would love to have more time to do that. Also interested in wood–but I’d really have to say that clay is my love. I definitely think of myself as being a sculptor. And finally…what objects define you, or say something about you? Also my tools. Especially this wooden clay tool I got from my time in Italy. And this old arm (parlor) chair….I think it belonged to my grandmother. I got it out of the attic in my parent’s house and have dragged it around with me since college. I’d love to reupholster it with some funky fabric, but haven’t gotten around to it. It’s funky, but it’s where I’m from. See more of Erin’s work on her website (www.erinmcguiness.com) or phone her at 510.388.6346. Her work is also on sale to the trade through the DeSousa Hughes showroom at the San Francisco Design Center. This entry was posted in CERAMICS, HOME, THE CREATORS, THE GOODS and tagged Artisan, Berkeley, DesignCraft, Earthworks, Erin McGuiness, Home accessories, Pottery, San Francisco Bay Area. Bookmark the permalink. Delighted to receive your article…I’m sending it on to family. as always… beautiful work, erin!